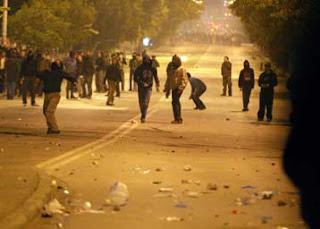 Excessive clashes, leading to injuries, prosecutions and material damages erupted the early morning hours of Sunday, around the university campus of Thessaloniki. According to the announcement of the General Police Office, during the clashes eight policemen were injured, when they tried to protect firemen putting attacked by youth, some of them had set on fire 2 ATMs and a pavillion. Clashes erupted a little after 2 am, when a group of youth came out of the universities and hurled molotovs against a bank on Aggelaki street, damaging the ATM. Then, they set on fire a pavillion on Ehnikis Aminis street and went back to the universities. 2 vehicles of the fire brigade were sent to put off the fire, but near "G.Gennimatas" hospital they were attacked with molotovs and brokes pieces of marble. To protect the firemen, police forces were deployed, but the youth attacked them as well with molotovs, stones and pieces of broken pavements and other objects. Damages were caused to parked cars on Ethnikis aminis. From the 8 policemen injured, 3 had to stay in the hospital, while the rest could go out after they were given first aids. According to the police, 9 persons where prosecuted, and investigations have started to make clear whether they took part in the clashes. According to "Aggelioforos" newspaper (http://www.agelioforos.gr/archive/article.asp?date=11/3/2008&page=12) the youth also caused damages to a local church. The stock markets are falling because the frauds that bankers and rich people have been doing there were seen . Governmentals are trying to make sure that the money which they lost won’t be destructive from them . The police and the governments are trying to take peoples’ money to save the bankers from jail ,and make the fraud by their selves, taking control of the banks. Police is putting the lives of bankers above millions of lives. The money is the peoples’ pain and struggle we must not let them steal us.